Have you ever been kept awake at night wondering how you can make your own epic peanut butter? We have! And now our dreams have come true thanks to this fantastic Peanut Butter Maker. Just imagine the possibilities - peanut butter and jam sandwiches, fillings for cupcakes, peanut butter on toast or a big dollop on a teaspoon with your name on it! And the best bit is that you made it yourself. It's not from a jar. It's from your very own peanut butter machine and it tastes phenomenal! There is no getting away from it. Peanut butter tastes great. It's one of those foods that you want to go back to time and time again. But if you're constantly being nagged by your mum or significant other to cut back on the peanutty good stuff because it contains additives and other nasties, the Peanut Butter Maker is the answer. The great thing about the Peanut Butter Maker is that you control the ingredients you put in your butters. And we say butters because peanut is not the only nut. How about almonds, macadamia nuts or even sunflower seeds? The choice is yours, and because you know exactly what has gone into your butter, you can eat it with a clear conscience. It really couldn't be easier to make peanut butter at home and with a little imagination you can come up with some fantastic concoctions of your own. How about swirling in a little melted chocolate to the butter once it's made? The possibilities are endless! It takes no time at all to blend the perfect peanut butter. Simply pop your favourite shelled and chopped nuts into the top of the Peanut Butter Maker and you're ready to go. Add a little oil and wait for the magic to happen! Within moments you'll start to see the smooth and tasty stuff start to pour out ready for you to pop into a jar or straight into your mouth if you're us! This really is the quickest, healthiest and most convenient way to make your own peanut butter at home and we are proud to offer the Peanut Butter Maker to our customers. It's easy to use, effortless to clean and can be used whenever you feel the need for some delicious homemade peanut butter. Once you've made it yourself at home, you'll never go back to the shop bought alternatives. 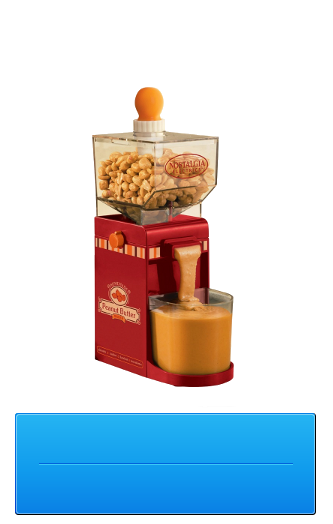 So, for the healthiest and most nutritious peanut butter on the planet, why not treat yourself to our Peanut Butter Maker? You'll be the envy of all of your friends!